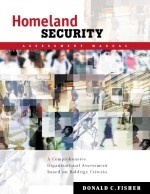 Homeland Security Assessment Manual: A Comprehensive Organizational Assessment Based on Baldrige Criteria by Donald C. Fisher, Ph.D. Many organizations have embraced the concept of improving overall performance by using Baldrige criteria as a benchmark to gauge their strengths and opportunities for improvement, and as a measurement of their overall alignment and integration of key processes. Since the terrorist attacks of September 11, 2001, this nation has made great strides in improving homeland security. Individual citizens, industry, and government leaders from all spectrums of American society have become involved in ensuring national security. This comprehensive and hands-on homeland security assessment manual will help organizations align the Baldrige Award Criteria for Performance Excellence with homeland security issues. These are issues which both public and private organizations must address in order to ensure a safe work environment for both their employees and customers of their products and services. Accompanying CD-Rom includes homeland security assessment scoring documents and questions to ask that provide valuable insights when analyzing your organization. Approximately 300 pages. ISBN 0-87389-640-8. 81⁄2x11 Softcover. 2004. Price $60.00. ASQ Quality Press.